OCETI SAKOWIN CAMPGROUND, N.D. ― Federal authorities have halted construction of the controversial Dakota Access Pipeline amid growing protests that were expected to draw some 2,000 U.S. military veterans. The Department of the Army has denied the final easement required for the $3.8 billion project to cross under Lake Oahe in North Dakota, it announced Sunday. Instead, it will conduct an Environmental Impact Statement to examine the impacts and explore alternative routes, it said. The 1,172-mile pipeline is being built to carry Bakken oil from North Dakota to an existing oil terminal in Illinois. Most of it is completed, except for a 20-mile section near the Standing Rock Sioux reservation. The tribe and demonstrators have raised concerns about the threat the pipeline poses to water and sacred Native American sites. The tribe has also argued, in a lawsuit to stop the pipeline’s completion, that the project violates federal laws and its environmental impact has not been fully studied. In a statement, Standing Rock Tribal Chairman Dave Archambault II applauded the news. “We wholeheartedly support the decision of the administration and commend with the utmost gratitude the courage it took on the part of President Obama, the Army Corps, the Department of Justice and the Department of the Interior to take steps to correct the course of history and to do the right thing,” he said. The Standing Rock Sioux Tribe and all of Indian Country “will be forever grateful to the Obama Administration for this historic decision,” Archambault added. He noted his hope that the incoming Trump administration would respect the decision. 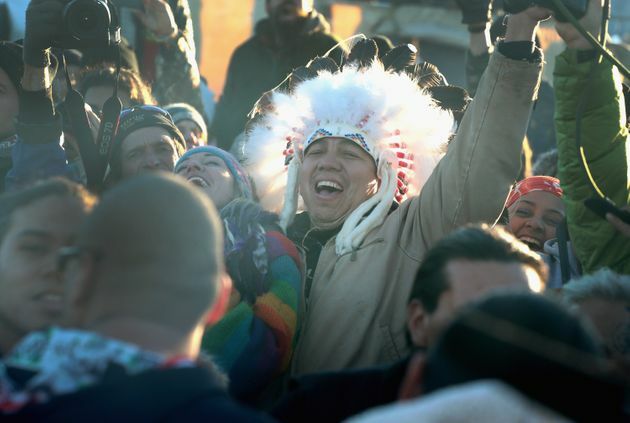 Native American and other activists celebrate after learning an easement had been denied for the Dakota Access Pipeline at Oceti Sakowin Camp on the edge of the Standing Rock Sioux Reservation on December 4, 2016 outside Cannon Ball, North Dakota. 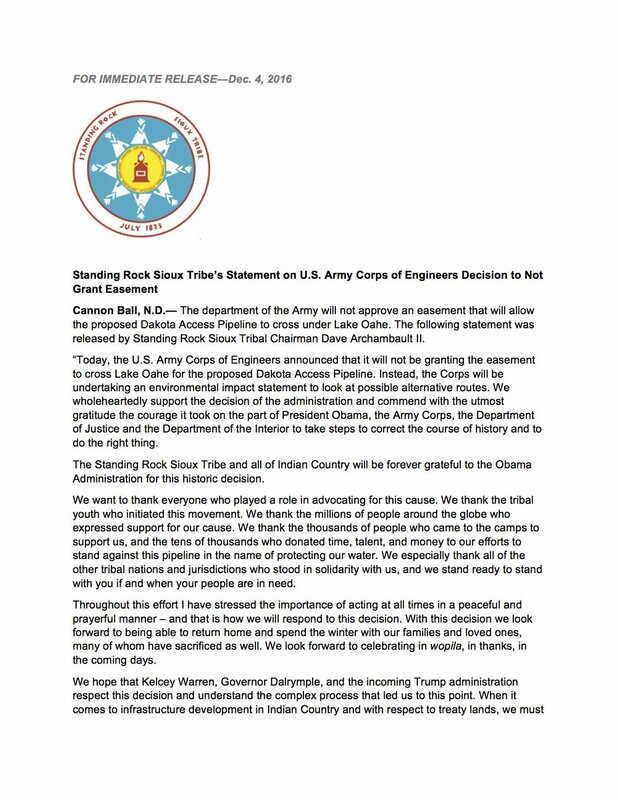 The US Army Corps of Engineers announced today that it will not grant an easement to the Dakota Access Pipeline to cross under a lake on the Sioux Tribes Standing Rock reservation, ending a months-long standoff. “The White House’s directive today to the [Army Corps of Engineers] for further delay is just the latest in a series of overt and transparent political actions by an administration which has abandoned the rule of law in favor of currying favor with a narrow and extreme political constituency,” the companies said. They added that they remain “fully committed” to completing the pipeline, without rerouting around Lake Oahe. “Nothing this Administration has done today changes that in any way,” they said. George added that he sees this as a small victory in the grand scheme of things and believes there is much more work to do regarding indigenous representation and nation-to-nation relations. “The federal government needs to respect our ability to govern ourselves, our land and who we are,” he said. 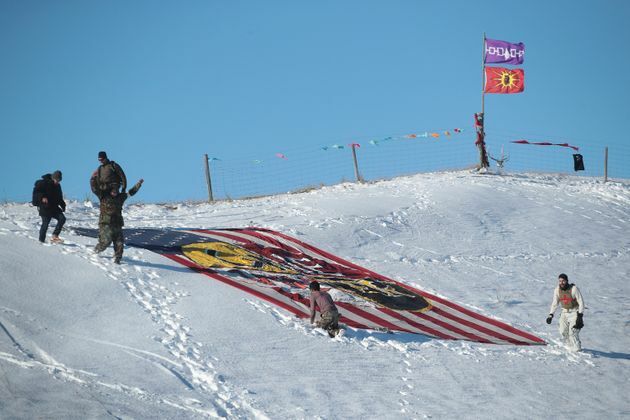 Military veterans place a flag that says ‘one water’ on a hillside above Oceti Sakowin Camp on the edge of the Standing Rock Sioux Reservation on December 4, 2016 outside Cannon Ball, North Dakota. Lance King, 44, of Kyle, South Dakota, located on the Pine Ridge Indian Reservation, has traveled to Standing Rock twice to join in the demonstrations. His most recent visit has lasted two weeks. Attorney General Loretta E. Lynch said that in light of Sunday’s decision, the Department of Justice would continue to monitor the situation. Fireworks fill the night sky above Oceti Sakowin Camp as activists celebrate after learning an easement had been denied for the Dakota Access Pipeline near the edge of the Standing Rock Sioux Reservation. Conservation groups quickly celebrated the news. Sierra Club executive director Michael Brune said he looked forward to further environmental review of the pipeline. Photographer Josh Morgan contributed reporting from North Dakota. This story has been updated to include statements from the American Petroleum Institute and Energy Transfer Partners.